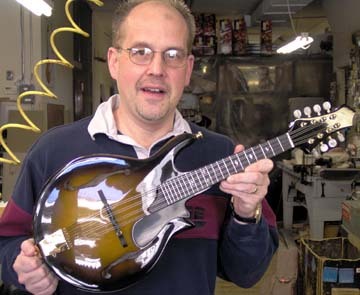 Mr. Eschliman, known affectionately as "Mandohack," has mandolins and isn't afraid to use them. An accomplished trombonist (I assume that means he knows the major scales in both keys) from Nebraska, Ted picked up the mandolin in 1998 and hasn't looked back since—even when changing lanes. He is a confirmed sufferer of MAS (Mandolin Acquisition Syndrome, for the uninitiated), having picked up, among others, an E. F. Elliott solidbody electric, a Rigel CT110 (below), and a custom Ovation MM68 (above) with a composite top. Guess you can never have too much plastic on one instrument—or too many instruments on plastic. I wonder whether trombonists suffer from TAS? All kidding aside, Ted has a very informative Web site about jazz mandolin playing and strikes me as a wonderful guy, although he might strike me as Boom Boom Mancini after he reads this.